This project will be a box art build with a twist. 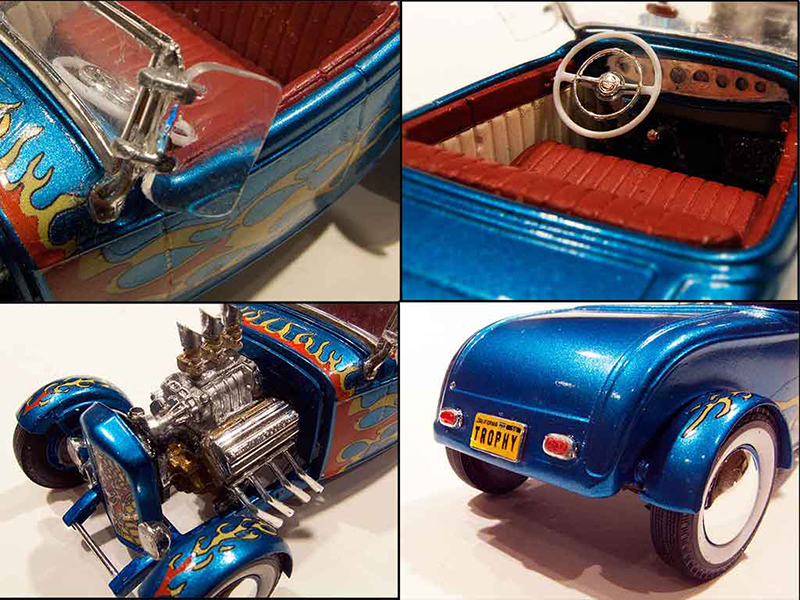 I’ve always admired the blue channeled roadster on the top of the original-release AMT Trophy Series ’32 Ford Roadster kit. But I’ve always preferred the more accurate body and better chassis details of the Revell 1/25th Deuces. So it was natural for me to imagine someday building the AMT box art using the Revell roadster kit as my basis. Now I’m going for it. One of fascinating things about classic box art that makes it so effective is the liberties the artists took with their illustrations. These are truly idealized, impressionistic renderings, rather than strict photorealistic depictions of the completed model. 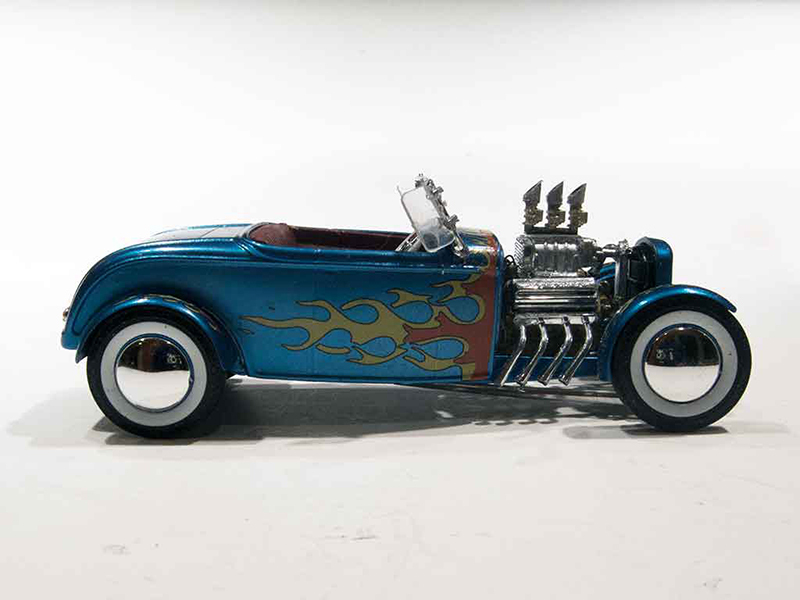 So in this example the little Deuce roadster looks remarkably close-coupled with a tough, tight stance. Some details are missing entirely, such as the headlight mounts. The GMC 671 blower and the carbs are absurdly undersized. The front end has a deep drop front axle which is missing entirely from the kit. And yet the overall look is totally “right” to my eyes. It begs to be modeled in a more accurately detailed version taking advantage of the modern Revell kits, while still, somehow, retaining the cool factor of the artist’s vision in the box art. That’s my goal. Below is a call-out of some of the details I’ll be watching out for as I build it. 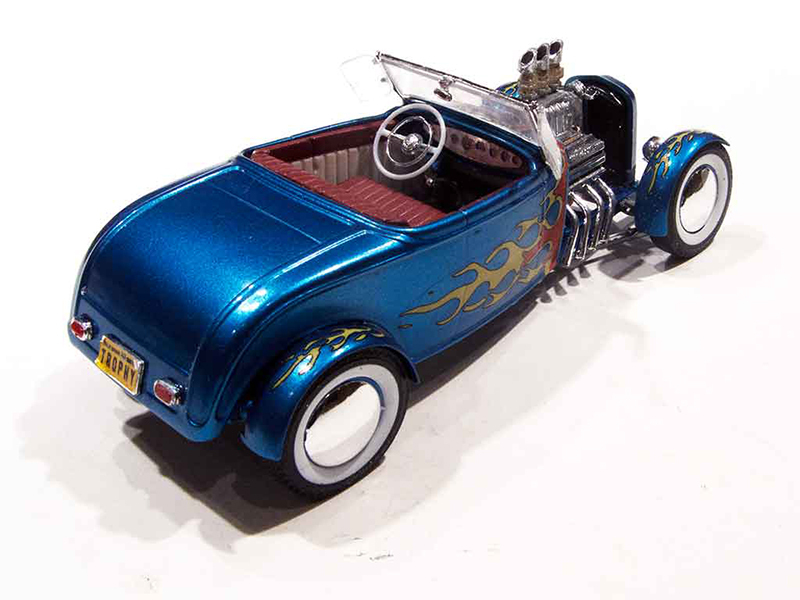 For those who might be interested, there was an excellent box art build the AMT kit posted online last year (see [a href="http://www.modelcarsmag.com/forums/topic/123803-amt-32-ford-roadster-1959-box-art-build/"]AMT Trophy Series Deuce Roadster Box Art Build[/a] ). I’ll be using that build as a guide as to what can or can’t be done while trying to use zero AMT parts and sticking with relatively accurate modern kit parts for the various elements. I think this should be great fun. Superb! I look forward to seeing this Bernard! I too am a box art fan. This should be fun for all of us . Your WIP's are always clearly presented with ton's of information and wonderful artistic photo's and art work. Like everyone else I'm looking forward to following along. Thanks for all the exceedingly kind words! I seem to be moving through this project at a rapid pace. Things are falling into place much more quickly than I had anticipated. I’ve decided to use the Stacey David Rat Roaster version of the Revell Deuce. 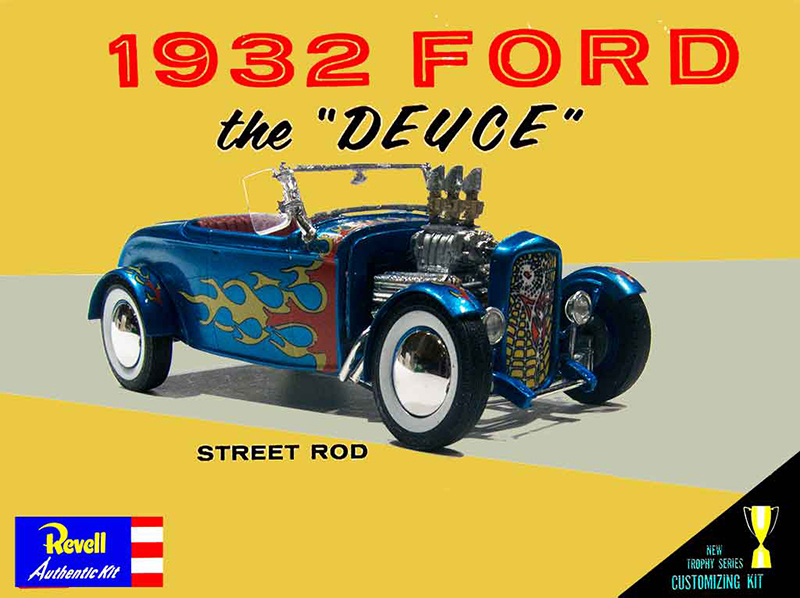 This is because, along with the stock style firewall which I’ll need, I can attend to some of the specialized modifications that Revell made to the original ’32 Ford Highboy release in order to make the contemporary Stacey David variant. This includes the notched frame rails to mount the exhaust system and the small extensions to the rear valance to surround the gas tank (see D below). The body channel will hide the frame notches, although I plan to fill them in nonetheless. As for the small rear extensions, they will form the ends of a subtle rolled pan I’ll fabricate. Along with the inset rear license plate mount of the Rat Roadster version, it should make for a tasteful period detail - one that’s not shown in the box art, LOL. After removing the gas tank I shortened the rear frame end and set the initial channel (see C below). It’s 6 scale inches, about the depth of the chassis rails at their deepest point. For the moment I haven’t Z’d the frame. I need to fill the real wheel wells, install the cycle fenders and rough in the front and rear suspension to see where I’m at with the stance. With the rolling stock already chosen, this will determine whether or not a Z is required at the rear. With the basic channel set, I was able to tackle the interior. 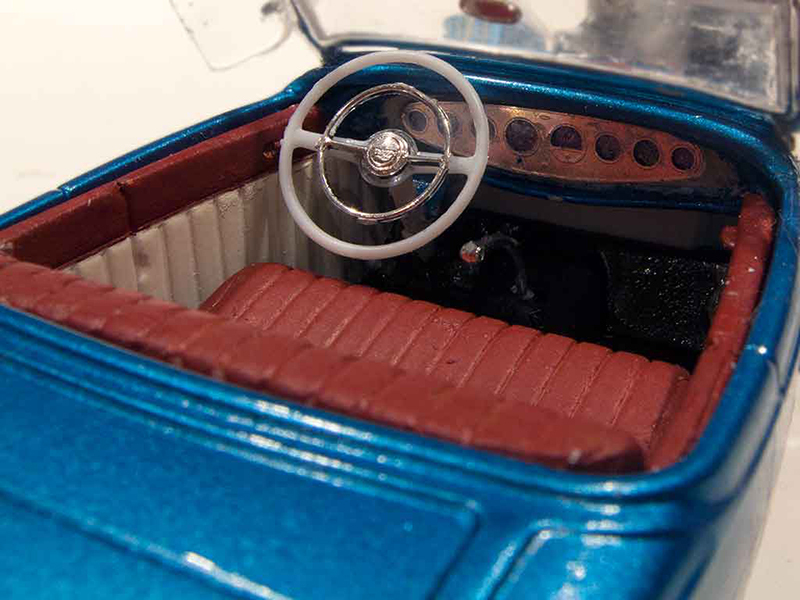 The interior floor, rear and side panels and dashboard surround are all from the basic Revell 1/25th Deuce Roadster kits (pre-Rat Roaster). I removed ¼” from the rear and side panels to accommodate the channel job. The Revell Deuce Highboy dash panel, with its cassette player and air conditioning vents, will be removed and a new piece fabricated featuring a 7-gauge P/E piece courtesy of Replicas & Miniatures Co. of Maryland. I also plan to use a 50’s style steering wheel, perhaps the one from a Revell ’48 Ford. 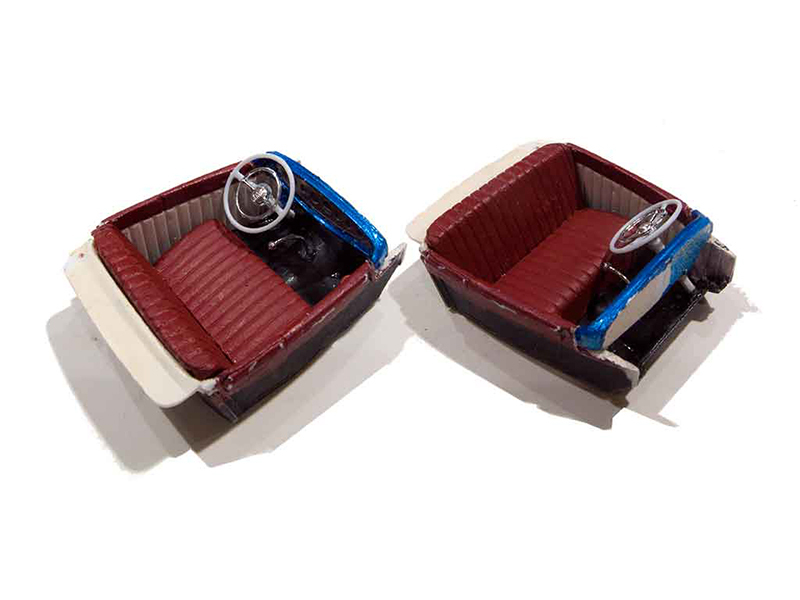 The seat is fabricated from a Revell ’32 Ford Tudor Sedan rear seat in an attempt to make a piece that resembles the simple vertical rolls of the seat in the AMT kit. It’s not a perfect match, but then nothing about this version will be. It’s roughed into place for the moment and still needs some fine tuning but it will do the job, I think (see A and B below). The decals will have to be re-scaled and distorted to fit the Revell parts and to reflect the box art. For this reason I’m borrowing a set of the original decals to scan and then redraw for this application. A couple of key visual elements of the box art are the boxy, close-coupled proportions and the shiny chrome plated domed wheel covers (the latter a styling element largely unique to early AMT Trophy Series models). Dennis Lacey suggested using the slightly taller wheels and tires from the Revell ’48 Ford kits in order to get closer to the proportions of the box art. As it turned out, although they are AMT parts, the chromed wheel covers from the AMT Doubled Dragster kit are a perfect fit to the Revell ’48 Ford wheels. So the rolling stock in now looked in (see center inset of the photo above). The cycle fenders, of course, are another important detail. I don’t have an original release (#132) Trophy Series AMT kit, or indeed, the 5-window version, both of which came with the cycle fenders shown in the box art. They are simple, smooth semi-circular examples proportioned to fit the kit AMT tires. The only AMT cycle fenders I do have are a set from the AMT 25T double kit. They are quite different from the Deuce fenders. 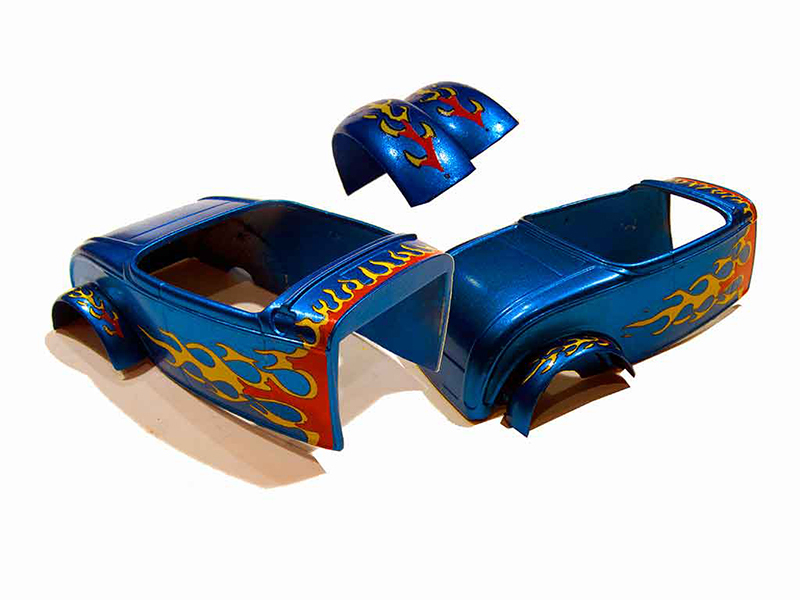 The Deuce rear fenders, for example, are mounted with pegs that you glue to the body, within the wheel wells. The 25T rears use struts designed to mount to the brake backing plates, similar to the front fenders. The 25T fenders also have a molding down the middle of the fender tops, whereas the Deuce fenders are smooth. I can modify my 25T fenders to suit but I’d love to locate a set of the originals. Happily, either AMT cycle fenders will fit the rolling stock I’ve chosen. 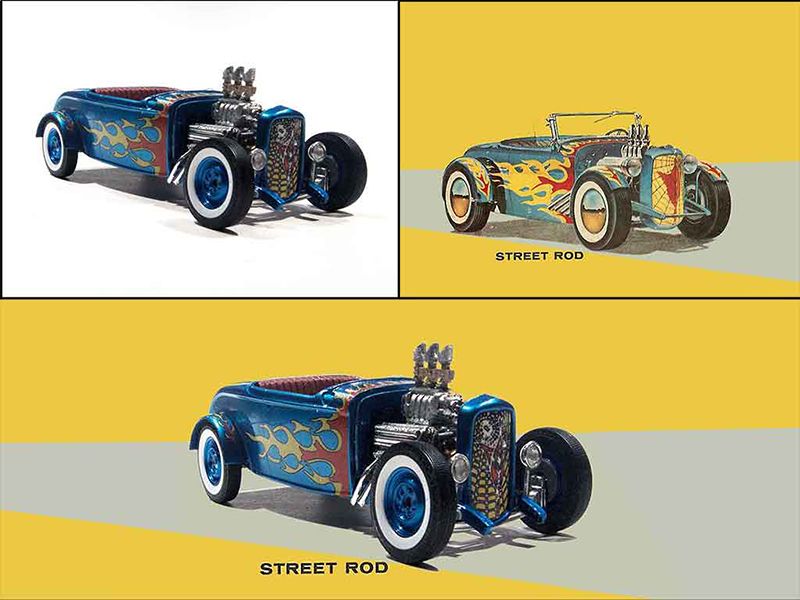 Below is a comparison of the two, the 25T style on the left on a ’34 Ford I built many years ago, and the genuine Deuce items as shown on Mr. Moto’s (Manuel J. Martinez_ excellent box art build I’m using as a reference. Things are moving along quite nicely, much to my surprise. 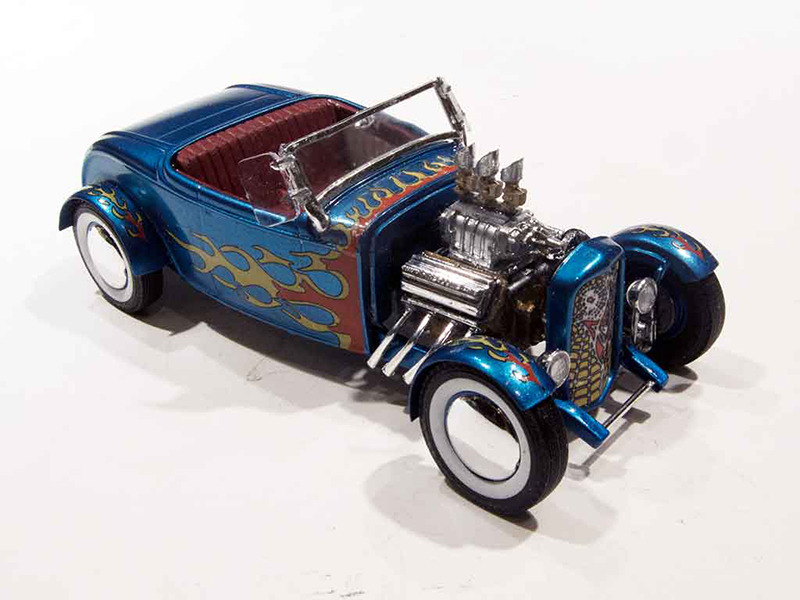 I still need to determine whether to modify the ‘25T cycle fenders or try to score the genuine AMT Deuce Roadster items. Only then can I determine the rear frame and suspension setup, so I have to decide very soon! Over the past two days I got some of the critical parts in. I was able to get a set of original issue AMT Trophy Series 32 Ford Roadster cycle fenders. Also the original issue decals for me to scan came in. After scanning them I cleaned up the images, touched things up and also made black versions of the pinstripes so I can print them on my inkjet if I ever need to. I'll run off some extra copies and get them bacl, along with the origal pronto. In the meantime more progress is being made. The interior is done and ready for detailing and paint. I cut out the Revell dashboard, installed a blank face. Now it's ready for the photo-etch 7 gauge dash panel. As mentioned I'm using a '48 Ford steering wheel. With the arrival of the fenders I've been able to finish the initial mockup of the body and chassis. I also filled in the door handle holes and made the small rear roll pan. It's pretty close to the box art, even in glaring white plastic and black fenders. If I can hide the rear suspension under the body I'll probably keep the Revell setup in the interests of keep this project simple and on track. That's it for now. Next up will be the motor. In a departure from my usual habit I’m resisting painting anything before I’ve test fitted the whole model. So it’s currently an endless display of raw plastic and blue masking tape. But I’ve often admired the results that some of my favorite builders get by adopting this discipline. Hopefully a little of that skill will rub off on me! With things going as well as they are I’ve decided to more closely follow the details of the AMT version where I can. In keeping with this I decided to convert the Revell chassis to the buggy spring style rear suspension of the AMT Deuce. I removed the rear crossmember and substituted a Revellogram ’37 Ford Truck crossmember, spring and rear axle. The axle and spring were narrowed and new spring mounts fabricated to lower the rear suspension to the same stance as the Revell setup. As called out in my first post, the box art includes un-boxed frame horns, so, with a little .125 x.015 styrene strip if fabricated that particular detail. 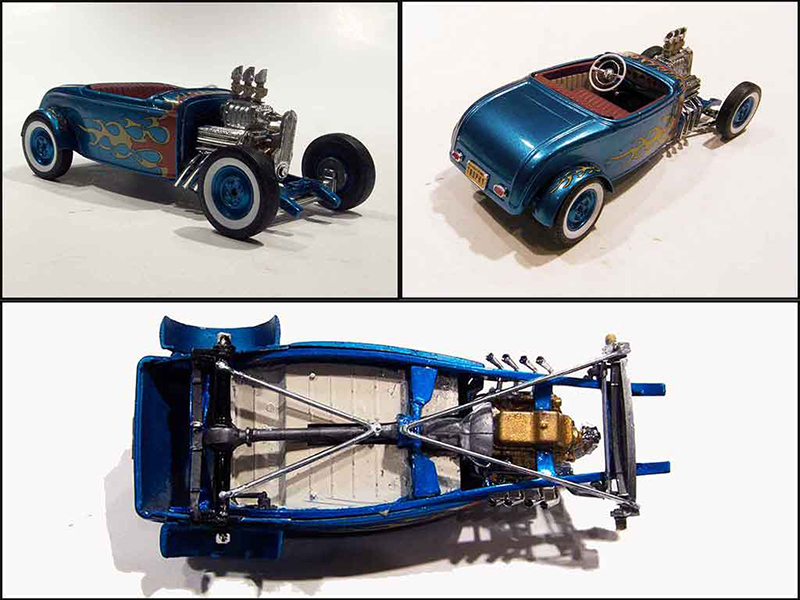 Conveniently, the Rat Roadster version of the Revell Deuce frame has the outer surfaces of the frame horns already smoothed and filled in, rather than having the indentations for the bumper mounts found on the full fendered Sedan and Coupe kits. The motor is largely built up now. I adapted the GMC 471 blower from the Revell Beatnik Bandit kit. The blower drive is, unfortunately, an AMT part, a chain drive from a’’29/’40 Ford Tudor kit. 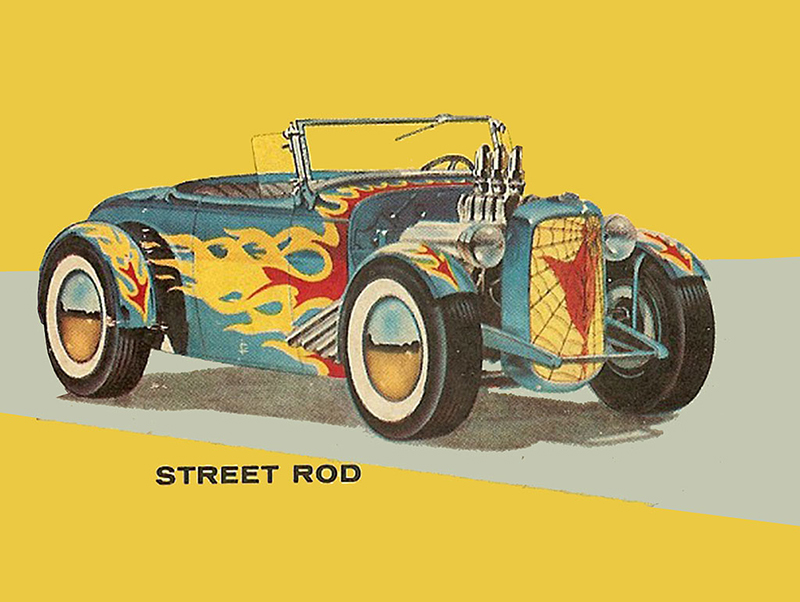 I chose it because it’s appropriate for the 1959 vintage of the AMT Deuce Roadster Trophy Series kit. The carburetion is currently mocked up using the rather blobilicious AMT triple “Strombergs” from the same Tudor kit. I’m not happy with the crude look. It’s not in keeping with the spirit of the Revell-based modern detail of the project. I’ll probably go with some more accurate modern ‘97’s and rework the manifold while I’m at it. The intake stacks were cut from aluminum tubing and will be smoothed out and polished. The exhaust pipes are from, of all things, a Revell 427 Ford Parts Pak. I had thought of fabricating my own exhausts but the fit and look of these pipes are true to the box art, to my eyes at least. The end of the summer usually brings lots of activity on the personal front. The rainy Northwest puts a premium on the sunny months so we tend to take our vacations in the early Fall when we’ve been able to take full advantage of the relatively brief window of favorable weather the region affords us. So, after spending September on vacation and inevitably recovering from it, I’ve been able to get back to the several modeling projects I have going. 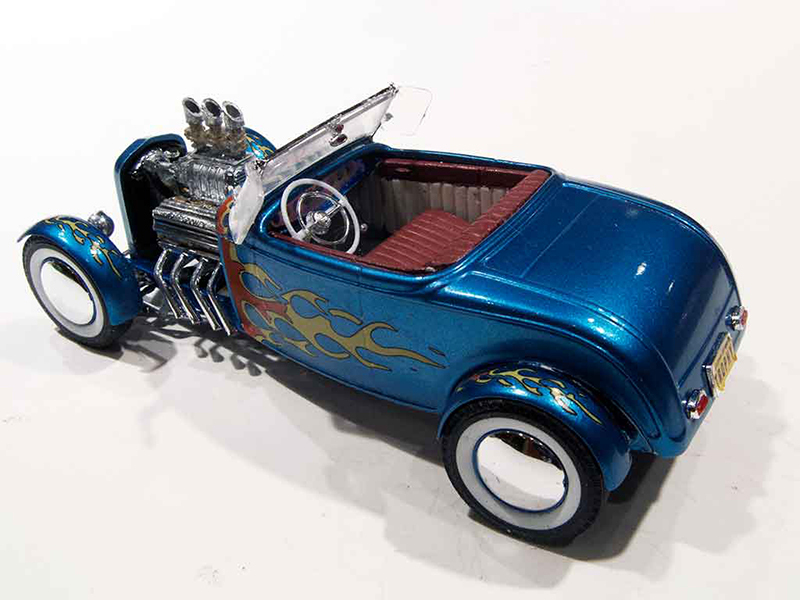 In the case of the Revell Trophy Series Deuce Roadster I have been able to get the body work completed and painted (in the Duplicolor Bahama Blue mentioned earlier) and the interior painted and trimmed out. I also completed the decals work and have received the parts I needed to complete the motor. After scanning the original AMT decals I used a set of Revell ’32 Ford 5-window Coupe flame decals as a reference to re-scale the AMT decals so they fit the Revell parts. The Revell grill shell is slightly larger and differently proportioned than the AMT piece so the grill panel needed some minor stretching to fit. In the case of the side flames, the AMT box art is massively larger than the actual kit decals. The flames extend all the way back to the rear wheel wells. This meant stretching the side flames some 30% longer than the originals. In addition, the lower edge of the AMT body sides curves upwards so that the edge of the firewall area is quite short. Combined with the slightly larger overall size of the Revell main body meant that the height of the side flames was increased by close to 20%. Because these 2 size increases are roughly proportional with the original AMT design the distortion is not very apparent. The cowl flames also needed some minor stretching to fit. 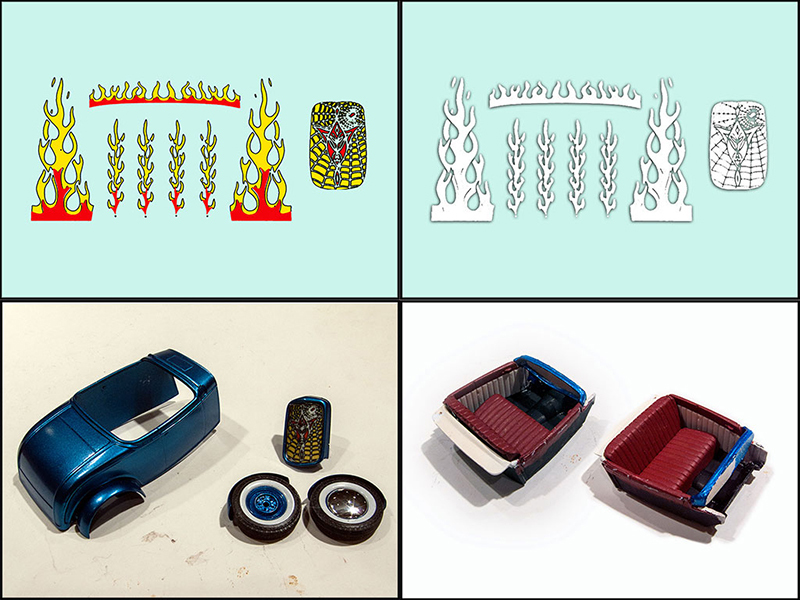 Since I’m using the original AMT cycle fenders the design of the fender flames remained untouched. The Bahama Blue is a relatively dark color. The transparency of decals printed using an inkjet printer, as I would if I printed my own decals, means that I would have to use a white underlayment. But the flames are too intricate to cut out a white layer by hand. The white needs to be printed to a clear substrate, so I will have to have the decals printed by a friend who has an ALPS printer that can print white to clear. I’ve prepared the artwork and having the decals done is next on my list. In the meantime I’ll build up the motor and chassis and test fit everything in anticipation of final assembly. Once the decals are done and applied it will be time for clear coat and polish and then completion. Below is a composite photo, showing the work done since my last post, including the decal master art, the interior and the basic paint. I’ve got 4 modeling projects going at once right now, two of which required custom-printed decals. The decals arrived yesterday and it was time to apply them to The Deuce (that’s the name AMT gave this model on the box of the first release). They came out very nicely indeed and the fit was exactly as I intended, allowing not only for the different proportions of the Revell body (vs. the AMT original) but also the oversized and distorted artists’ impression of the kit decals as represented on the on the box art. While waiting for the decals much of additional work required got done. The chassis is near completion and will be the subject of the next update. In order to finalize the chassis modifications I had to complete the motor as well. As mentioned earlier it’s the Hemi from the Revell ’32 Ford 5-window. 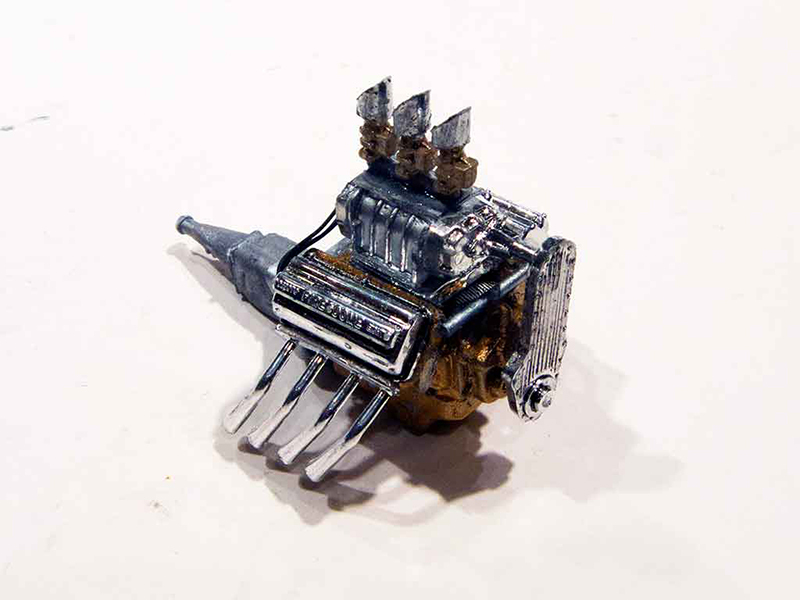 The GMC 4-71 blower is from the Revell Roth Beatnik Bandit. 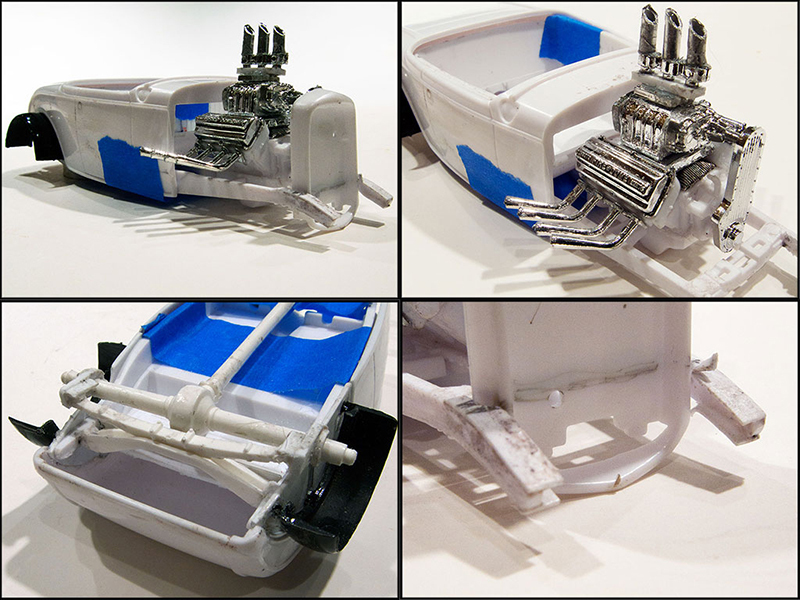 The super-detailed Stromberg 97’s are 3D printed pieces from Maple Lead Modelworks and can be found here: https://www.shapeways.com/product/BFYHQDNSX/1-25-6-pack-stromberg-97-carburetors?optionId=63101329 . The carb stacks are styrene tubing finished with Molotow chrome. The period correct chain drive is one of the few AMT parts I’ll be using and comes from a ‘39/’40 Ford Tudor kit. The interior got finished out, too, and is ready to slip into the body. This is a brief update but actually reflects a fair amount of work, mainly on the chassis, and the final fit of the main body to it. The chassis is now complete. IU decided that the undercarriage should resemble the AMT kit as much as possible. I deleted the modern hot rod front and rear suspension setups from the Revell kits. 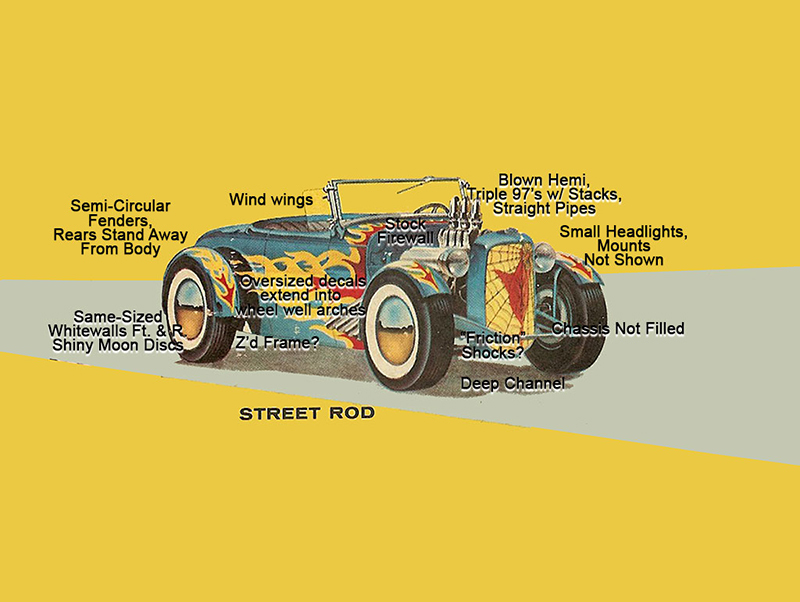 The rear suspension is adapted from Revellogram ’37 Ford Truck and Delivery Van kits including the rear cross member, transverse rear spring, and rear axle. The rear axle was narrowed to fit the ’32 Ford body width. The front suspension is based on a Monogram ’40 Ford pickup dropped front axle and spring. As on the AMT kit, the front and rear shocks are Houdaille van type (so-called “friction shocks” but actually hydraulics). They are out of Revellogram ’30 Ford Sedan kit. Both sets of control arms, front and rear, are sourced from a Revellogram ’37 Ford Delivery Van, but swapped so that the rear set is mounted at the front and vice versa in order to fit the dimensions of the ’32 Ford frame. The steering is a combination of the Revell ’32 Ford steering box and some fabricated bits. The taillights are the ovoid ’48 Ford pieces from the various Revell Deuces, thinned down for a more realistic appearance. The license plate frame is the kit piece from the Rat Roaster kit to match the Rat Roaster rear panel. I also began work on some of the more challenging small details. 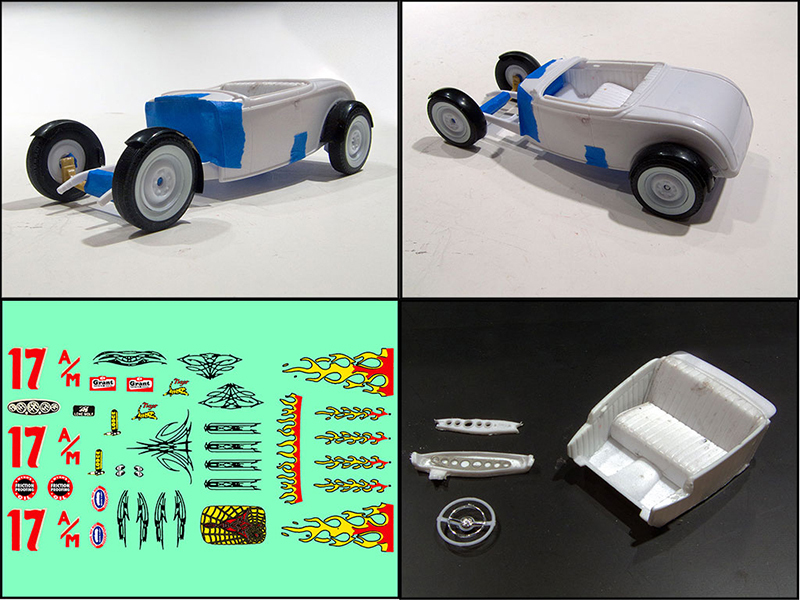 I am adapting the wind wings from a Revellogram 1/24th scale ’32 Ford Roadster kit. They come with etched floral patterns on them and I was able to sand and polish them out. They will be adapted to a Revell 1/25th scale Deuce Roadster windshield frame which, like the AMT version, will remain stock height. I will also fabricate tubular headlight mounts for the small Revell Deuce headlamps. Below is a summary composite picture, showing the completed body and interior mounted to the frame with the wheels mocked up in place and a view of the completed undercarriage. This is turing out great! Excellent work! I’ve just about got this project wrapped up. I got the body mounted to the chassis, the wheels and tires glued in place and the grill and headlights installed. I made simple tubular headlight mounts from Plastruct .020 butyl covered wire and mounted the small King Bee style headlights that come in all the 1/25th Revell Deuce hot rod kits. The model is starting to drift slightly from the box art. Almost all of this is being imposed on me by the realities of using the Revellogram kits. For example the headlights are mounted much lower than in the illustration, but mounting them up high would look odd using the small headlamps so I chose a lower, better proportioned mount. You might notice that I didn’t use a stock style firewall either, despite calling it out in the introductory post. It turned out that the only way to get the Revell Hemi from the 5-window Deuce kit properly mounted required using the inset firewall that comes in all the 1/25th Revell Deuce kits. But some of the most critical details still remain including mounting the front fenders, the windshield and the wind wings, and the shiny chromed Moon-style wheel discs, all important components of the box art. Below is a summary composite photo of the recent work. This will be the final update. Everything’s done except for the final “beauty shots” photography. My biggest concern was the windshield area, in particular the wind wings. 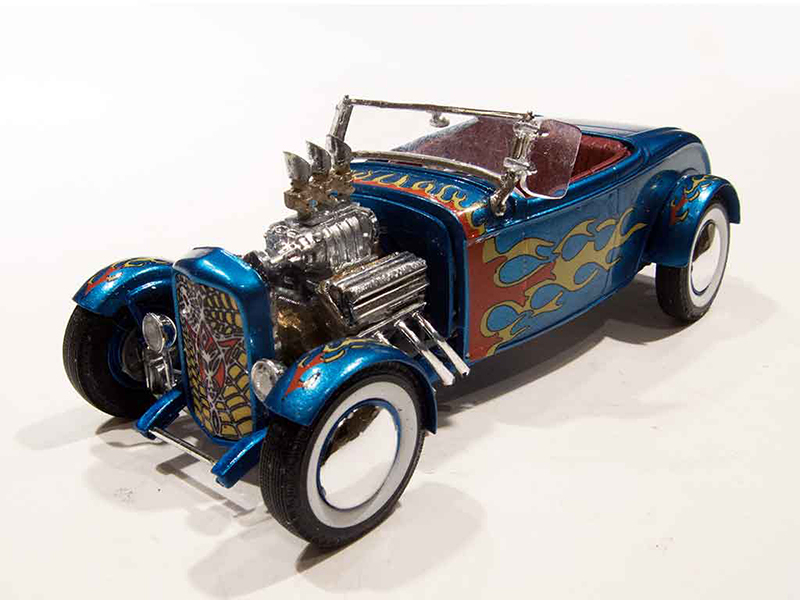 As mentioned earlier, the wind wings were cut out from a Revellogram 1/24th scale ’32 Ford Roadster kit. The version I had parts from had filigreed engraving in the corners of the wind wings which had to be sanded out and then polished. Then I trimmed away the main windshield glass being careful to preserve the mounting brackets which I reshaped to fit the full height windshield from a Revell ’32 Ford Highboy Roadster (1/25th scale) kit. The brackets were finished out in Molotow chrome. Then the wind wings were epoxied to the windshield frame. As it turned out everything went off with minimum drama – much to my relief… The wheel covers from an AMT Double Dragster kit were a perfect fit to the Revell ’48 Ford steelies so no dramas there, either. Phew! 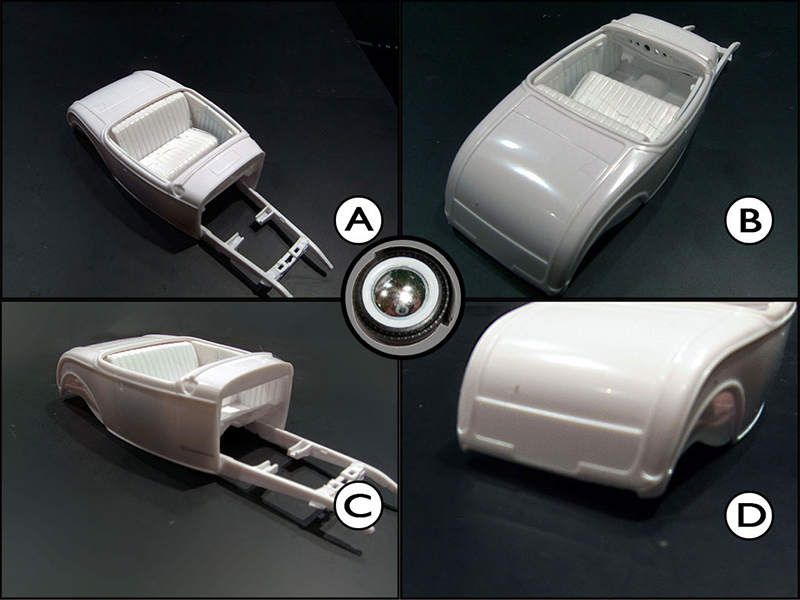 Below is the final summary composite shot, showing some close-up details of the rear roll pan area, the wind wings, the final front view featuring the front fenders, motor and chrome wheel discs, and an interior shot showing the full width photo-etch dashboard from Replicas & Miniatures Co. of Maryland. The next post will be of the final presentation photographs. Just stunning, Bernard! For the unknowing, it's a box-stock build with a glance at the box art. Your play-by-play really highlights the many changes you incorporated to produce "the look". I commend you on both the concept and the execution. This build is a tribute to the roots of the hobby. Well done! Super! The cycle fenders remind me of the early hot rod kits I built back in the late 50's and 60's. You nailed it. Looks great, Bernard! Its amazing how you duplicated the box art! Nice work! Great work all around Bernard! This is one of your best builds yet IMO. Great execution and finish! you nailed it. Your camera work is just as amazing. Absolutely a fantastic build! I love it! This is a neat project from a concept point of view. I would have never thought to replicate the box art. I tend to "not see" the box art because it is usually a "stylized" version of the car, and "not real" to my eye. This is a very interesting idea to actually made the box art the goal. I learned a lot, from a paradigm shift in my own thinking, to the many processes involved in the creation of your model. Thanks for sharing. Thanks for sharing Bernard. Superb build and great rendition, very well done! Thanks to you both. Much appreciated!